Sara Hidalgo is a P.h.D. candidate in Latin American history at Columbia University. Her interests include the history labor, welfare, family and public health in Latin America. 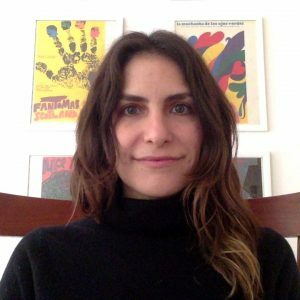 Her doctoral dissertation, preliminary titled "Informal Lives: Family, Labor and Welfare in mid-20th century Mexico, examines the history of welfare policies and its relationship to informal labor in mid-20th century Mexico. “Defining a simple domestic: Domestic Workers, the Supreme Court, and the Law in Post-revolutionary Mexico, 1931-1970,” Forthcoming in International Labor and Working-Class History, (2019). “Hacia una cultura de la prevención: higiene, campañas sanitarias y medicina social en México”, Estudios de Historia Moderna y Contemporánea de México, 54 (2017). “Prologue” to Jean Meyer, Una Revolución Tras Otra. México: El Colegio de México, 2013. In addition to her dissertation writing, Sara has experience translating academic work, teaching at Columbia University, and has worked at history museums and other cultural institutions.